Typographic maps have become rather popular in the last few years as many different cartographers and map-makers have sought to create a map based entirely of typographic elements. MapCarte has featured a number of these (e.g. Irish Surnames MapCarte 76, Axis Maps Mapcarte 179) because they showcase a different approach to design and communication. 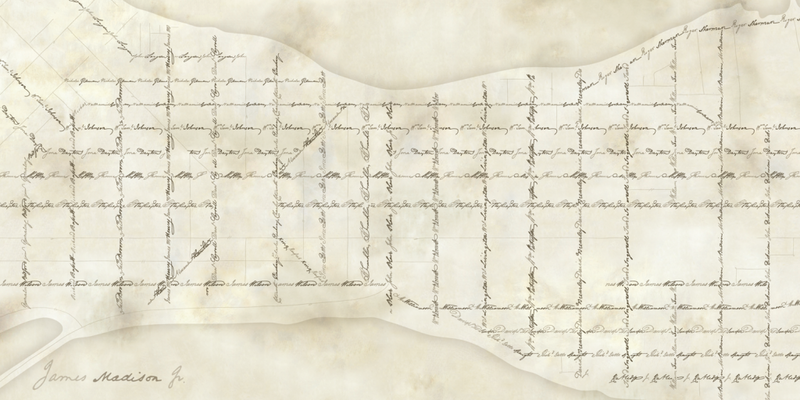 Here, Daniel Huffman has created a beautiful historic looking map that recreates the street network of Madison, Wisconsin using the street names. This sort of approach might be somewhat ordinary for many towns but here is a case of the map content providing detail that elevates the end product to something rather different. 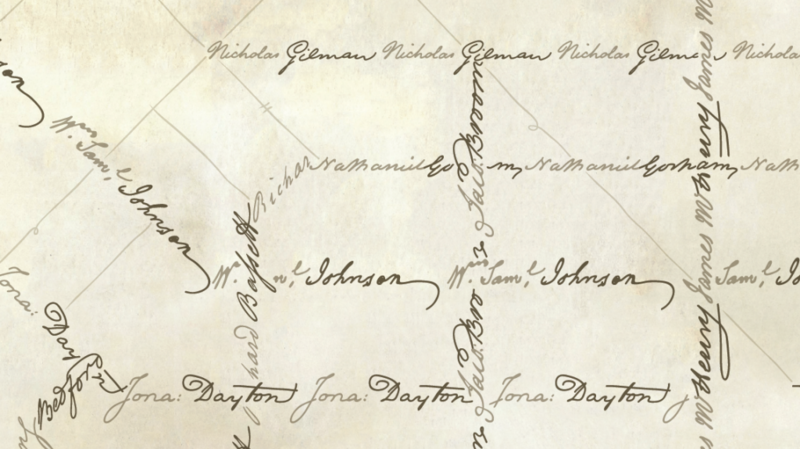 The street names have meaning as they are all based on the signers of the U.S. Constitution, so named by James Doty when the street network of Madison was laid out in 1836. The map, then, not only provides a depiction of the names but also a link to history of the city and the country. Huffman goes further than simply using an historic looking font though – he traced scanned copies of the signatures from the Constitution document itself and shapes the street network accordingly. The mix of size, style and colour gives the map a sepia appearance and creates interest. The signatures add personality to the map and provide a link to the individuals themselves. Each street takes on something of the personality of the signatory and gives it a sense of belonging. It creates distinct patterns and makes each street unique where, conventionally, we’d use standard typeface and treatment to secure uniformity. Huffman shows us that by breaking the rules we can create something both different and meaningful. As Huffman himself notes the map “aims to reconnect Madison’s modern citizens with the people their city was intended to memorialize”. The design fits that objective, creating not only a lasting memorial but also a beautiful cartographic product. Thematic maps can often be somewhat bland if the overall layout isn’t considered. Simply getting the construction of a choropleth or proportional symbol map right only goes half way to creating a successful map that draws people in. Combining the theme of the map with symbology that illustrates and connects to the message can lift the map above the mundane. Of course, the context within which the map sits also plays an important part. 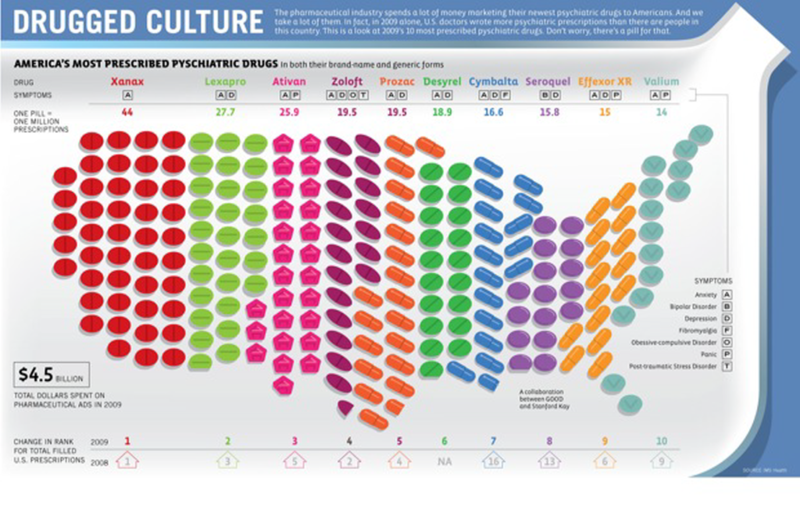 In a simple, formal report, mapping the most prescribed psychiatric drugs in the USA might need to be plain. As an accompaniment to a magazine article, a newspaper piece or a poster there’s increased license to be more graphically daring. This map by Stanford Kay makes great use of the shape of the country as a literal container (tray) for different coloured pills. Each different type of pill acts as a series of small multiples and, overall, a cumulative histogram. It creates a cartogram of sorts and provides an attractive illustrative approach to the map which invites people to investigate the detail. The legend is organised to relate to the different drugs and there’s a good amount of information around the map to provide key facts. The title also leans towards something catchy to lure people in and provide a graphical hook. Overall, simple, colourful and a nice marriage of thematic map and graphic design. 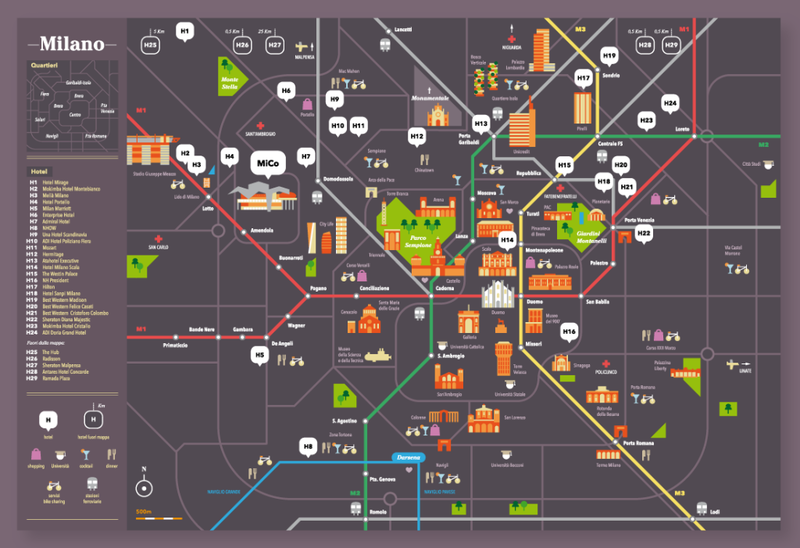 Maps are routinely used in advertising and they are normally used for one specific reason – to give the impression of just how far the phenomena being advertised has spread. We see numerous examples of maps that show us the spread of Starbucks or Walmart for instance and the map is really just a placeholder for the containment of thousands of points that we’re supposed to interpret as ‘they’re everywhere’. That may be true but sometimes advertisers use maps in far more inventive ways. This 1985 advert for Holiday Inn gives us the same impression of national coverage. 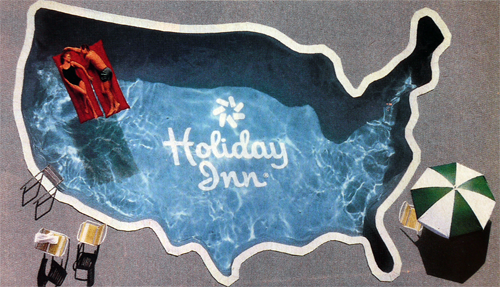 The use of the map of the United States and the imprint of the logo on the pool’s lining gives us the clear message that you can find a Holiday Inn in all corners of the country. But the advert goes further. The pool is sun-lit and inviting. It’s clean and welcoming with the parasols and chairs. The relaxing, carefree couple give us a sense of how we might expect our stay to be. Of course, all of these messages vary between the blatant and the subliminal but they combine to give us a great graphic that does the job of advertising the brand. Maps can be extremely powerful tools in advertising but that also reminds us of the power they have in more mainstream cartographic use. People believe what they see. Maps are extremely good graphic devices to support a whole range of different messaging. That said – I’ve never been to a Holiday Inn and seen one of these pools. Wouldn’t it be nice if they actually did exist! 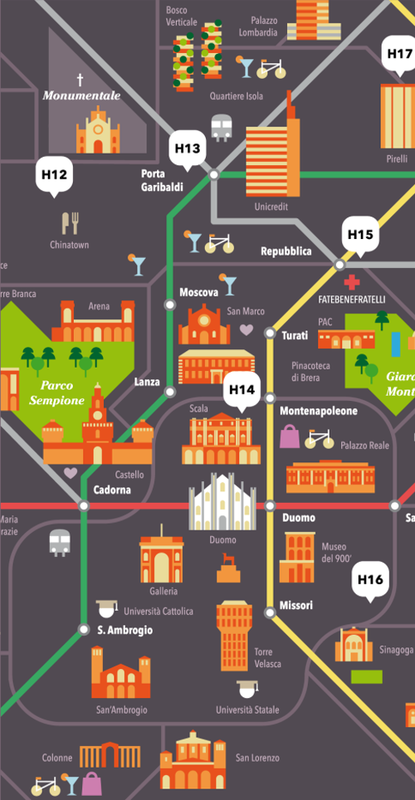 Distilling a complex city like Milan into a map to support a 3-day trip to the city by a tourist unfamiliar with the area means additional constraints for the cartographic processes. The processes of selection and omission become vital, perhaps moreso than for a general purpose map which has the luxury of providing the scope to include more. Here, if you include more than can be reasonably navigated in three days you risk the user becoming frustrated, or perhaps trying to achieve too much. Matteo Riva’s work in graphic design and illustration sees him use simple geometric shapes and straight lines in much of his work. He uses a lot of saturated block colours and a lot of contrast. Typographic components are key to the overall design and play an important role. All of these facets are seen in his map of Milan. Clean, simple geometries and vivid use of colour creates a collage of the city. Key places are marked but the white space (grey given the background colour) shows how much is missing. The benefit is it gives the selected places space to breath on the map. None of the graphics is competing for space. At a glance it’s obvious what are buildings or parks or roads or the subway. Underground stations and hotels feature prominently because they are the main hubs people traverse between and through. The design supports the map’s purpose well and the unconventional graphic approach lends a certain character to the map that shows that different isn’t necessarily a bad thing in cartography. You can see more of Riva’s illustrations and maps on his web site here. Imaginary cartography comes in all shapes and sizes but making the map look convincing goes a long way to creating the illusion of reality. Aaron Kidwell has based this work on the hugely successful television show Breaking Bad and named his town after the alter-ego of main character Walter White. 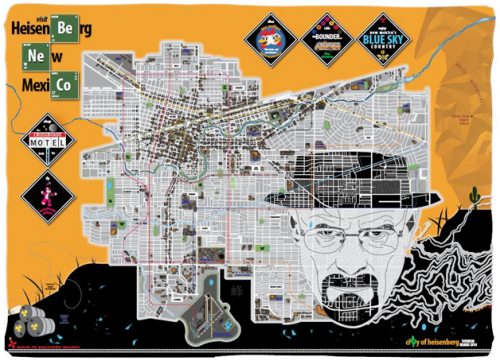 The imagery used throughout the map aligns well with the symbolism of the show itself, particularly the graphics and the periodic table style typographic elements. The map is more than just a cultural reference though. The cartography is clean and balanced. The map detail, predominantly in greyscale but with some accent colours, is fresh and well crafted. The hierarchy of detail and the contrast between features shows that the style would work perfectly well on tourist maps and brochures for more standard map products. The golden/black background situates the map and the detail of the abstract mountainscape on the right is again unique. Finally, the character of White peers out from the topography and Kidwell has done a great job of merging the ‘reality’ of the map with the non-reality of the other imagery. All in all, a very well constructed map that leans heavily on cultural references and rides the coat-tails of the hit television show. The cartography needed to be up to the mark though; and it is.